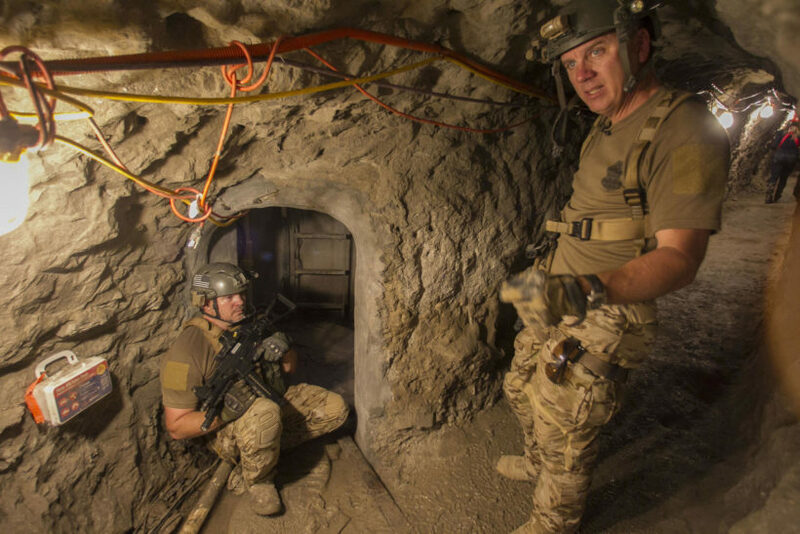 (by John Wilkens, Los Angeles Times) – For the last seven years, the Confined Spaces Entry Team (who call themselves the tunnel rats) have been going underground to locate, map and seal off the tunnels used by cartels to smuggle drugs from Mexico to San Diego and beyond. Theirs is a little-known part of the high-stakes hide-and-seek game that plays out daily along the border. While much of the attention…has been focused on…what happens aboveground, more than 80 tunnels have been found in California and Arizona since 2011. Warehouses constructed close to the border in Otay Mesa and Tijuana provide camouflage: an out-of-view place for a tunnel to start and another for it to end. The area’s clay soil is particularly good for tunneling — not too soft or too hard. LeNoir is an operations officer for the Border Patrol. He heads the five-member tunnel rats, and he was standing one recent weekday morning near what’s known in law enforcement circles as the Galvez tunnel. Several of the team members are military veterans, and their uniforms resemble those worn by soldiers: camouflage pants, helmets, vests, guns. Team members volunteer for the assignment, and to join they first have to crawl through a two-foot wide pipe for about 20 yards. That helps weed out agents who are claustrophobic. Increasingly, the tunnels are getting narrower and shorter — they’re quicker to build that way, and cheaper. One found last year was only 14 inches wide. Getting inside the Galvez tunnel is simple by comparison. Visitors climb down 70 feet of metal ladders, installed in a concrete shaft built after the underground smuggling route was discovered. It intersects the tunnel in a spot between the primary and secondary border fences. “These tunnels wouldn’t meet any mining or construction standards that we are familiar with,” LeNoir said. If wood is found inside shoring up the walls and roof, it’s not because of a devotion to structural integrity, he said, but because a collapse happened while they were working and they had to fix it. 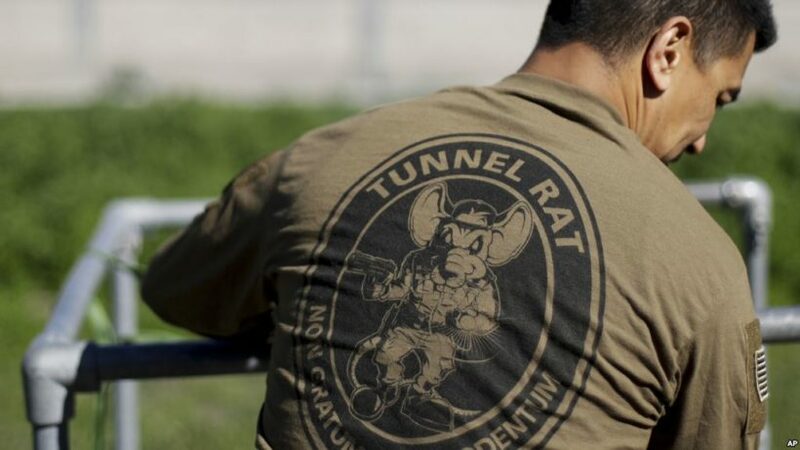 The tunnel rats are part of the Tunnel Task Force, which also includes representatives from Homeland Security, the Drug Enforcement Agency (DEA) and Immigration and Customs Enforcement (ICE). It was formed in 2003 as officials noticed that even though most drugs are driven across the border at ports of entry, hidden inside cargo trucks and other vehicles, tunnels were becoming a major issue. After a tunnel is found and cleared of smugglers, the tunnel rats are called in to check it for evidence and map it. They make sure the air is safe and the ground stable, and then crawl in with tape measures, compasses and lasers. Then concrete is poured into the tunnels at various places on the U.S. side…. Team members said what they like most about the work is the variety. Sometimes the work has a feeling of deja vu. Officials on the Mexican side of the border don’t always have the resources to seal tunnels. At least eight times in recent years, the Border Patrol says, newly discovered tunnels turned out to be old ones. The smugglers started in Mexico using what was already there and when they came to the concrete on the U.S. side, they dug around it — until they were found again, another round of hide-and-seek that shows no signs of ending. 1. When was the Confined Spaces Entry Team established? What does the team do? 2. a) How many tunnels has the Confined Spaces Entry Team found in recent years in California and Arizona? b) Describe the tunnels that have been found by the team. 3. a) How/when was the Galvez Tunnel discovered? b) How does the team use the Galvez Tunnel today? 4. a) Why does the team call themselves tunnel rats? b) How are team members chosen? – What test must they pass? Why? 5. 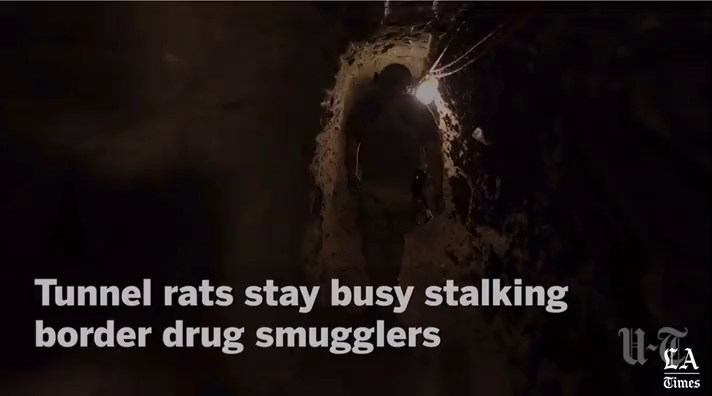 Why did the team switch its focus from smugglers to cross-border tunnels in the past 10 years? 6. How important do you think it is to locate and seal off these cross-border tunnels? Explain your answer.